I am a HUGE fan of bone broth!! I drink a cup every morning and recommend my fertility patients do the same! 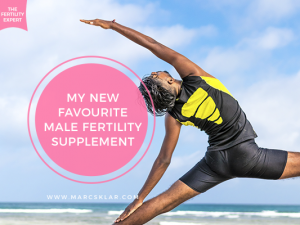 This week I focus on Bone Broth and fertility. Check out my interview Justin Mares from Kettle and Fire to talk about Bone Broth and fertility! While transitioning into a new and healthier Lifestyle, co-founder Justin learned about Bone Broth. He started his bone broth journey making his own at home and realized it needs to be improved and there was a market for this amazing product bone broth! While he was creating his at home Bone Broth, he wanted to send some to his brother Nick. When he came up short in his internet search, he decided this was a market he wanted to dive into with health, wellness, and quality ingredients! They are the only selfs stable product that will last for a year and a half without opening. They have no additives to make that happen. In this category of bone broth, they are the only selfs stable broth that uses all organic, grass fed, cage free protein with no additives. You can find bone broths out there that don’t have the key ingredient in bone broth, bones! 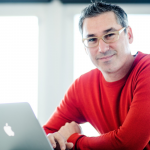 Kettle & Fire’s focus is to be a high-quality product that does it job to support your health. 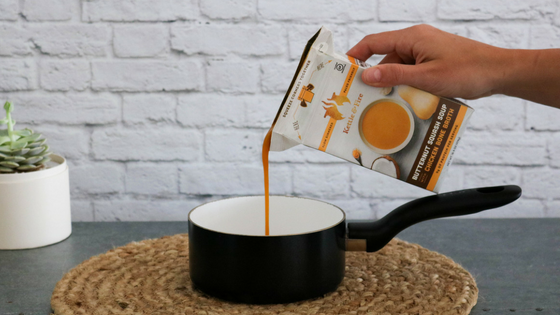 I have tried other bone broth brands out there and nothing comes close to Kettle & Fire. You can taste the quality. If you worry about costs when it comes to healthy products, take into consideration that your health is the most important place to not cut corners because you end up paying more in the end. Bone Broth is a foundation nutrient/supplement that I recommend to my patients. A key element for fertility is your digestion. If your digestive system isn’t healthy functioning, your hormones won’t function properly or take priority because your body will be focusing on your GI. To keep everything moving through your body, you want a healthy and strong GI. Bone broth helps with inflammation. The collagen in bone broth is helpful to bring back healthy tissues to injured areas. And overall it helps with muscle and bone development. 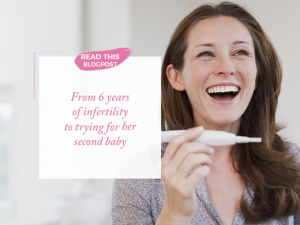 When it comes to fertility this is very important especially around the time of implantation. If you have an autoimmune issue or compromised immune system, often that issue can start in the digestive system. Bone broth can be used to repair the lining of the digestive system and heal the gut. 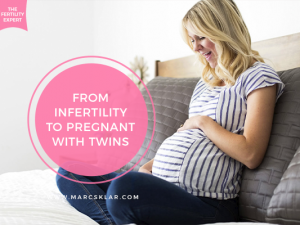 I dive deeper into the ingredients of bone broth and how they benefit your fertility in my previous article: “Why Drinking bone broth every day helps you get pregnant! How to incorporate Bone Broth into your fertility journey? Can you list out all the healthy ingredients in canned butternut squash soup? 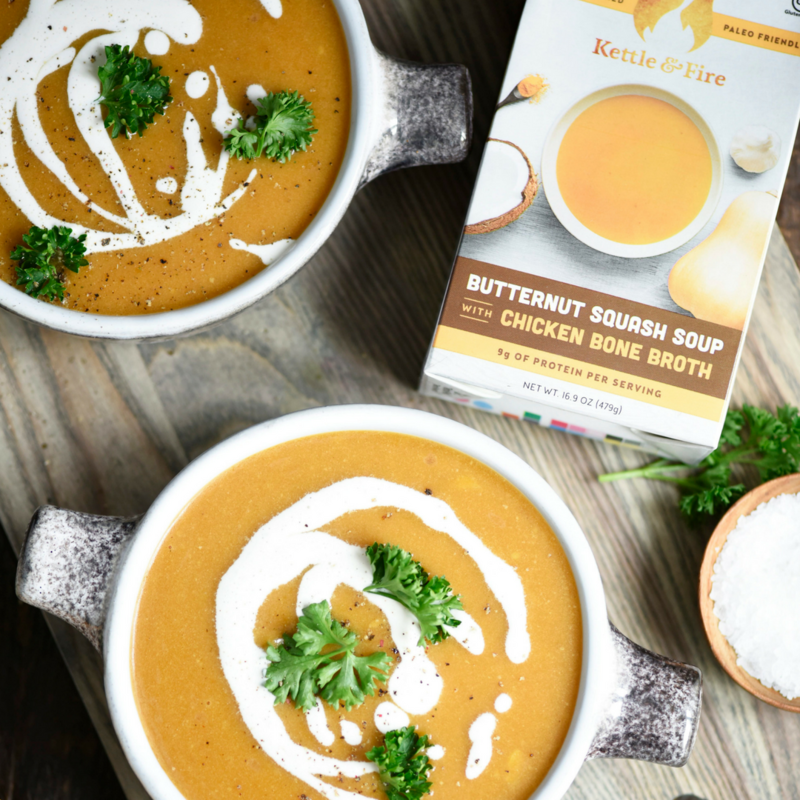 Kettle & Fire created a brand new bone broth-based butternut squash soup, which is packed with creamy coconut milk and organic veggies and spices. It’s shelf stable and non-frozen without any preservatives or additives just like their bone broth. This will be your new go-to healthy meal replacement! Get your own supply of Kettle & Fire today! Order Kettle & Fire today!